If I should say anything that could be interpreted as being critical of PhpStorm, I pre-repudiate it now. I don't know enough about how it works yet to be issuing any sorts of opinions.
. 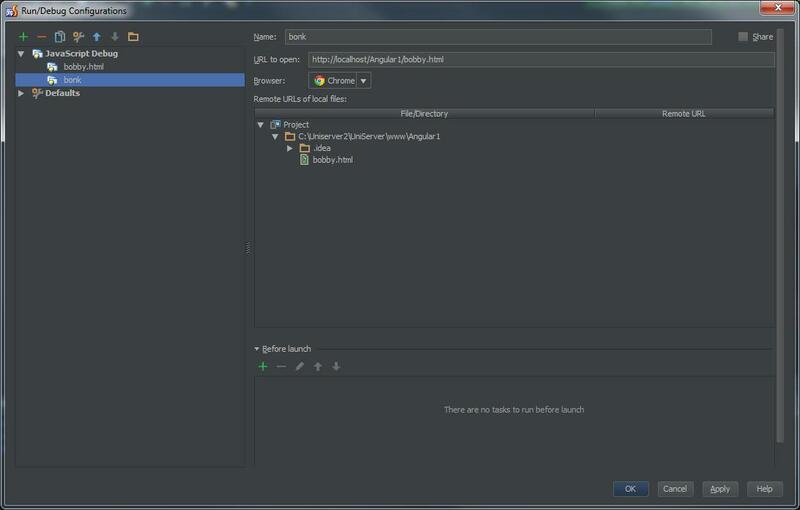 The JB IDE extension is installed in Chrome and showing the "JB" little signature in the upper right.
. Version 6.0.3 of PhpStorm as an evaluation.
. Project created with "Web server is installed locally, source files are located under its document root". PhpStorm is clearly starting the webpage and the output in this test html file IS going to the console window, and there aren't that many settings in the debug configuration screen to get wrong. I do sometimes still get the message in the lower left of the screen that reads "Waiting for connection from JetBrains IDE Support extension for Chrome. Please ensure you have installed the extension or see help." And then nothing at all seems to happen, including just running through my code without stopping. And at other times it just blows through my code and doesn't hit any breakpoints. I have no idea what's going on. This doesn't look like it should be that difficult. What does your run configuration look like? Are you running your application on Apache server? Please check the sample project attached to the message - does debugging work for you using it? I use Apache 2.4.4 VC10, as the config info on the first post describes. The little project zip file works perfectly as far as I can tell. I have attached a JPG showing MY debug configuration. It's the same as yours (logically) except in the "Remote URL" column where you have a path set to the root url of the project on the server. 1. How did you create this project? As "Web server is installed locally, source files are located under its document root" as I did, or something different? 3. Did you create this as local or remote? Thanks for your help. Your zip file is giving me my first useful clues. >It's the same as yours (logically) except in the "Remote URL" column where you have a path set to the root url of the project on the server. Well, I GUESS the problem is solved. At least as far as I can tell, inasmuch as debugging is now working. In the help file, the text referred to "File/Directory" column as being a read-only field and the "Remote URL" as being a "text box", though there is ABSOLUTELY NOTHING to indicate it's editable on the screen, completely UNLIKE "URL to open" and "Name", which are clearly edit boxes. So I blindly clicked in the blank area and, lo and behold, there is an easter-egg text box there. 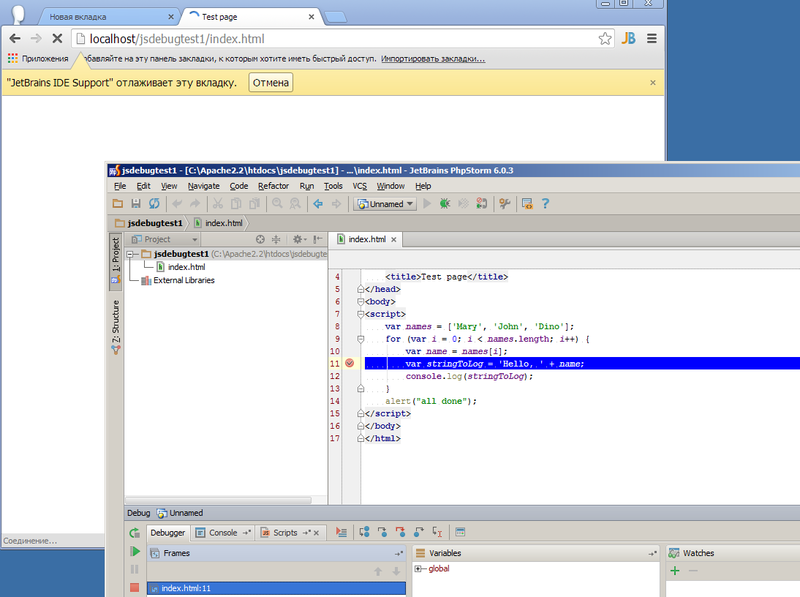 Setting it to the directory of the project on the localhost server started the breakpoints working. I have NO IDEA why that would make a difference. While I'm deeply gratified and very relieved that debugging is working now, at least so far, this kinda seems a little diabolical to me. Had you not sent me your nearly structurally identical but WORKING project, I could have spent YEARS trying to figure this out. 1. Why have the text field in the Remote URL appear hidden/invisible, completely unlike the other text fields on the same page? At least put a little shadow box there or SOMETHING. 2. Why does the "Remote URL" field need to be there at all? One more or less describes this path when creating the project; why not fill it in FOR US, at least as a default? 3. PhpStorm has enough info to draw a conclusion about what this value should be from the "URL to open" field; why not pull this value from THAT, at least as a default? Once a person KNOWS that this field is editable and what value to put in it, setting it is no big deal. But there are no error messages, labels, instructions or even the slightest hint of what is going wrong. For the newbie, it just doesn't work and no hint as to why. Remote URL - in this text box, type the corresponding absolute URL address. Absolute URL address of WHAT? The project dir URL or the URL of the file being debugged? It probably ISN'T the URL of the file to debug because THAT'S already in "URL to open". But why does it need the URL of the directory of the file being debugged then since it already HAS that as part of the "URL to open"? Very confusing to a newbie. At this point I'm assuming there are reasons for these oddities that I just don't understand at the moment but that will become clear in time. Thanks for taking the time to give me your working zipped example. I'd still be thrashing if you hadn't done that. This may be the crux of my failure to comprehend. Is this common terminology in a web programming context, or just PhpStorm? IOW, are "file://" protocol executions always called "local" and EVERYTHING else, including executions from servers located completely on the same development machine, are ALL remote servers?